Shafee Mohammed is an Optometrist by profession. He received a B.S. in Optometry from Birla Institute of Technology and Science (BITS), Pilani in India in 2007 with full scholarship support. He subsequently received two fellowships, one in Orthoptics and one in Vision Therapy, and then practiced for a year and a half, attending to over 50,000 patients, mostly children. Through his practice, Shafee came to understand the problems that arise in daily lives for the visually impaired. For instance, a visually impaired (VI) child in India, has no access to the same curricular training (beyond primary school level) as a visually sound peer. Shafee wishes to explore the intricacies of the cognitive abilities of the human brain, to identify the areas of the brain that contribute to “learning aided by vision” in the visually sound population, and then explore channeling the efficiency of this “unused/under-used” area for other sensory perceptions in the VI. His goal is to develop a personal digital assistant that can potentially help any VI navigate (and a manage a ton of other things!) independently. Shafee believes that “prevention is better than cure.” Thus, on a larger scale, he aspires to (a) educate both the public and policy-makers about the importance of including visual abilities other than visual acuity and color vision (such as contrast sensitivity, field of vision, depth perception) in setting visual standards for driving license procedures (in India the current contribution of poor visual performance to RTAs and loss of life is about 26%), (b) improve occupational eye safety standards in across the globe, and (c) increase awareness of and improve standards of personal protective gear, especially for the eyes, since the demand vs. availability ratio for the transplant organs (Cornea) is roughly 10:1 globally (WHO statistic). Shafee’s current research interests include visual perception, working memory, contribution of vision towards working memory in visually “normal” and VI, neural plasticity and cognitive training of the VI and its effects on the academic performance of the VI. 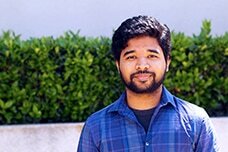 Currently, Shafee is a doctoral student at the University of California, Irvine's School of Education department with an emphasis on Learning, Teaching, Cognition, and Development (LTCD). His research will be focusing on identifying the contribution of vision to working memory in both visually sound and visually impaired populations.